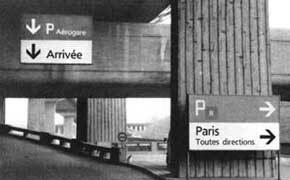 The air traffic of Paris was developing so rapidly that the capacity of Orly Airport soon proved inadequate. A new, modern airport was therefore planned for a large site to the north of the capital. Paul Andreu, a dynamic young architect and engineer, was entrusted with this project. He formed an architectural study group comprising interior architects, color specialists, philosophers, a musician and a typographer. Long evening sessions for brainstorming were accompanied by food and drink. The discussions were something quite new for me. Each member of the group just said the first thing that came into his head on successive subjects. I remember one of them recommending that the experience of take-off be made to last as long as possible, so that passengers could truly and deeply experience their separation from Mother Earth. After half a dozen glasses of wine we heard proposals like the desirability of laying down a pasture for sheep at the airport. Nevertheless, Andreu always knew how to bring the discussion back onto the right track. I was commissioned to design the entire signage system for the airport. Everyone thought that I would want to use the Univers® typeface, but I was aware that this kind of sanserif face had too round and closed an effect for the easy recognition of word-signs. I took out the drawings of Concorde, the sanserif which I had designed for the Sofratype in collaboration with André Gürtler, and made some sketches. The banana-yellow background recommended by the color specialist was obtained by superimposing several transparent Letraset color foils, and we cut the word "Départ" from a rather bolder and more expanded version of Concorde, with the word "Departures" pasted above it in black. Proof of better legibility than Univers was not hard to demonstrate. In addition, Paul Andreu was fascinated by the thought of using a special kind of "Airport Type". What I may say as a critic, after thirty years of the use of Roissy (C-de-G) Airport typography, is this: that the Roissy face is too light and too closely set. Moreover there is too little space, too narrow, around the letters, especially in the signage for the access roads. The first thing the driver sees on arriving is the colored rectangle. At first, Paul Andreu was very much against the use of pictograms and he persuaded me that the word "Bar" is just as recognizable as a drawing of a wine-glass. 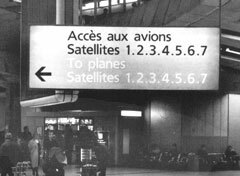 He started with the assumption that the air traveller was familiar with the international language of airport facilities; but we soon found out that the signs for "Ladies" and "Gentlemen" were not always clearly understood. We resisted the idea of using silhouettes of male and female figures, or in the case of left luggage lockers, a suitcase with a key. In the space of 25 years the problem has completely changed. Nowadays, more and more pictograms are used from the series which has meanwhile been internationally introduced, since more than half of all passengers are tourists from every part of the globe and many of them simply do not know the Latin alphabet. For such people, a language of signs is easier to learn than a set of word-images. 1998: More than thirty years later I come with the journalist and writer Anne Cuneo and a television team to make a documentary film about my life. I am astonished to see the extent to which the building has grown. An amazing TGV rail station has been built across the chain-like pattern of the airport. The former system of yellow panels with black and white lettering has been retained for the first three circles of the building, but with a much better presentation. The yellow has become much darker and the quality of the type is excellent. In the newest circle, after the station, the signage has been done anew. The Roissy face, in a light version, has been engraved in thin metal sheets by laser beam, with yellow foil attached to the back. I was also pleased with the use of display screens for information. The old Monospace typeface has been replaced by Roissy, which is very clear and readable on the big monitor screen. Contrary to all these positive impressions, however, I must mention the hanging central display panel, which with its digitally controlled 5 x 9 dot matrix illuminations is completely unreadable. 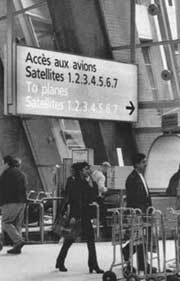 "The airport at Roissy was conceived as an ‘Arrival and Departure Machine’. Signage and lettering are very important owing to the short distance tothe aircraft." Construction of the Frutiger arrow.